animals.ekstrax.com has previously published a lot of articles on snakes and this is the one which we have now thought of. This article will deal with various amazing and interesting information about sea snakes or Hydrophiinae. 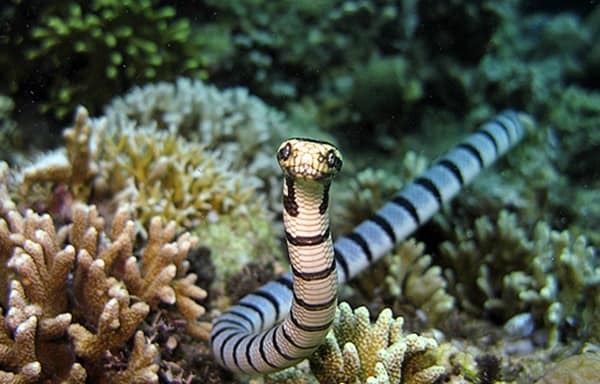 The sea snakes of Australia are very famous and known to be a popular member of the reptiles family. This creature is individually very unique and has really different characteristics from others. How can a snake be different from other snakes but for them we should say that each and every snake species possesses unique characteristics and that makes them very special from others. 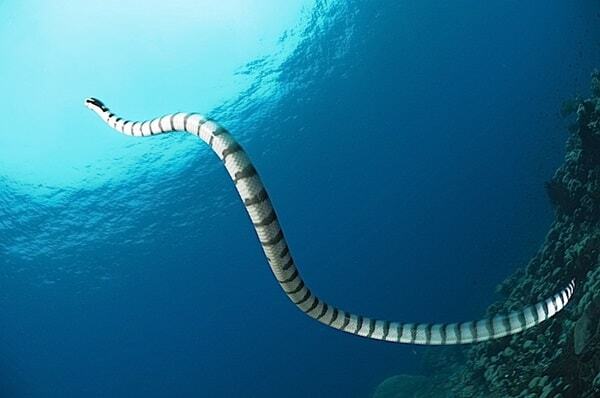 Body Structure: Australian sea snakes have flattened tails which helps them in swimming. You can also notice a paddle like tail structure which is ideal for swimming in sea waters even in deep sea level. The nose of the sea snakes are designed in such way that they contains valve which stops the water to enter into their respiratory system as they breathe through their lungs and not the gills. Normally they are found in shallow waters where they swim comfortably in the deep sea level. The lungs about which you were saying above is extended almost their entire body length which also helps them to control the buoyancy to store air for dives. 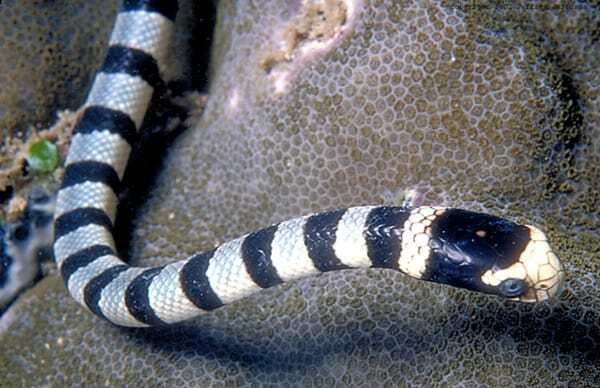 Most of the sea snake scan also inhales oxygen through their skin. There is also a special gland under their tongue that excretes excess salt from their body which enters with the sea water. The body structure of a sea snake is itself very interesting and its shape is almost like a keel of a boat. Most of the species band bands and rings of colors all over their body and like other all snakes these sea snakes also camouflage. Sea snakes shed their skin much more than the land snakes and each shedding is estimated on an average of 2 weeks. This is due to the prevention of growing of barnacles and other animals on their skin. These parasitic creatures don’t harm the snakes but actually make a lot of obstructions in swimming. This is the only known cause for their frequent shedding. The scales on the either side of the body is generally are smaller in size than the land snakes and normally these scales don’t overlap each other. 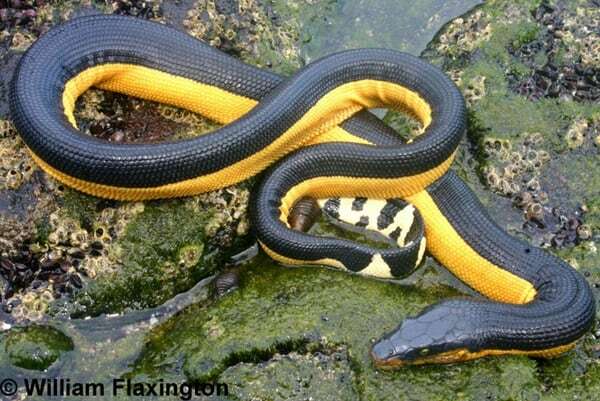 This proves that sea snakes will have to face a lot of problems moving in the lands. 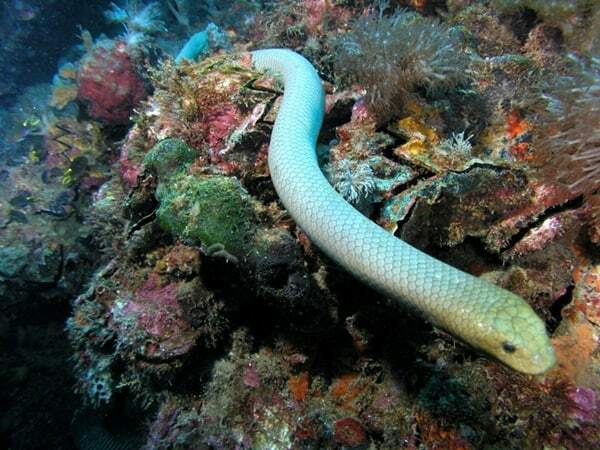 Normally an adult sea snake grows up to 120-150 cms with the largest being 3 meters. Diet: These snakes mainly feed themselves on various sea fishes and specially the eels. 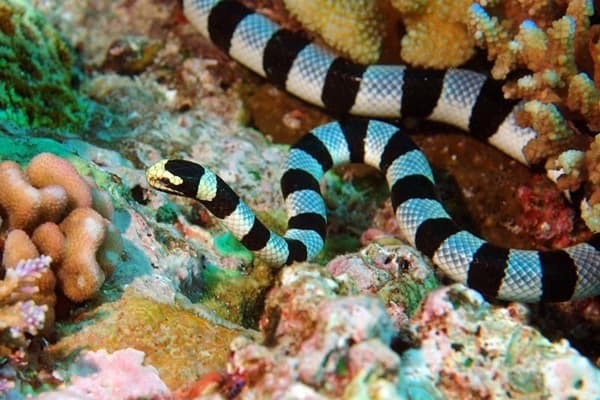 Some type of sea snakes relies on crustaceans, fish eggs and mollusks. The fine sharp teeth present on their mouth helps them to catch up their prey before they swallow it. By sliding each of the jaws of both sides they stretch their skin and slowly swallow the prey. Toxicity: All the sea snakes discovered till now are mostly very venomous and are known to produce some of the most dangerous venoms in the animal kingdom. But snake experts say that most of species of sea snakes are very non-aggressive in nature and it is very rare that they attack with too much aggressiveness. Predators: Normally sea snakes are in a safe side as they don’t face any problems from the small sea creatures but the sharks, large predatory fishes, and crocodiles are their main predators. Eagles are also known to be their predators but only when they come to the upper surface of the water. 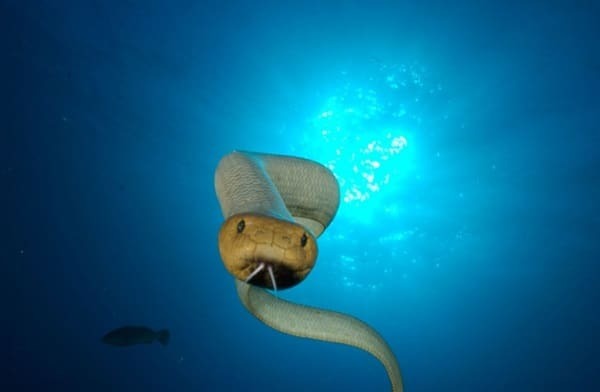 Nature: Sea snakes are active in both day and night and they often bask or relax in the sunlight at the surface in the morning and afternoon. If they are disturbed at this time, they can dive to a length of 90 meters. Normally they are seen to stay underwater for a short time of 20-30 minutes but can stay there for a long hours if needed. The most amazing part of their behavior is that they are mostly found in schools. They love to stay together all the time probably to protect themselves from predators. 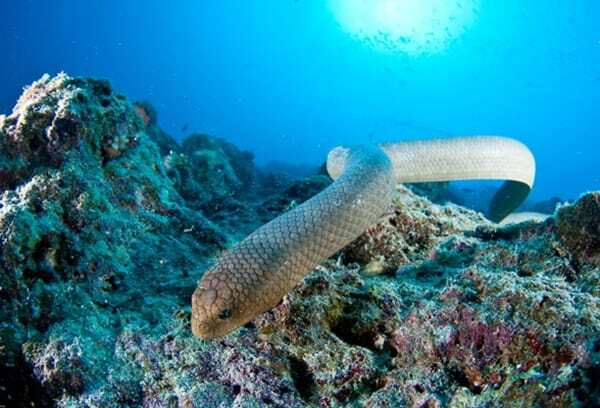 Existence: One species of sea snakes is classified as vulnerable, and another one is classified as endangered and other two are classified as critically endangered by the IUCN. One of the most popular myths related to this snake is that sea snakes have fixed front fangs and they can open their mouth wide to swallow the prey items at once. But it is not at all a true fact and they are like the other snakes in this context. Actually the mouth of the sea snake is too small enough and that also if it bites a human can only bite on the hand and nowhere else. 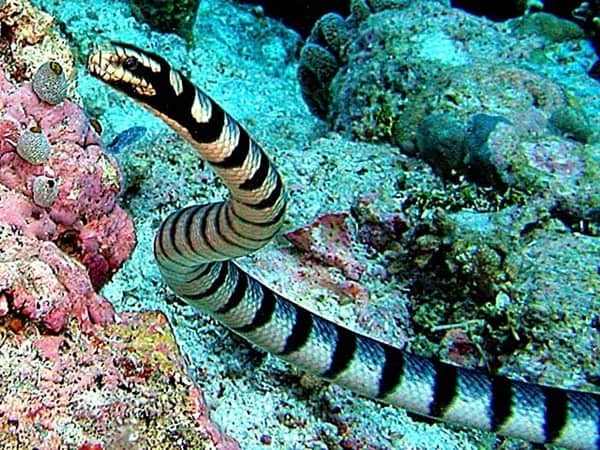 Again some people believe that sea snakes never come to the land areas until they are very sick or injured. But there is no evidence of logical cause behind this belief.